Spectacular !!! Stunning ! 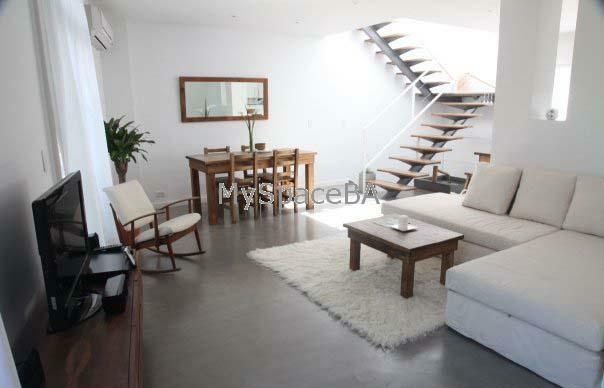 !two bedrooms recently renovated to a very high standard located just two blocks away from Plaza Serrano in the heart of Palermo Soho . Total Area: 134 m2 (1442 ft2) , Indoor Space: 96 m2 (1033 ft2) Outdoor Space: 38 m2 (409 ft2) Step off the street through a secure door into a chandeliered hallway. Enter the apartment and a gently gurgling Zen fountain greets you. A spacious kitchen/living/dining area opens through two original French doors onto a balcony where you can sip coffee at an antique French bistro table. A study area and a very private bedroom with en suite bathroom and rain shower complete the lower level. Upstairs you will find a master bedroom flows into a luxurious bathroom with an inside/outside Jacuzzi. It has an exit to a private deck, complete with a slate waterfall, bamboo and lavender plantings, teak recliners and a teak patio set.